In photo: Everything that I ordered plus two freebie extras in the plastic wrapping. :) Very cutely packaged and surrounded by light pink tissue paper in a bubble envelope. Invoice and copy of my custom listing were enclosed with a nice note from Amy. I love it when shops include freebies, I know its an extra cost to them and totally do not expect them. Its such a generous and kind act and a very nice surprise! Beach Time Body Frosting - The perfect blend of sand, sea, and warmed golden suntan lotion with hints of tropical fruit. This fragrance is sure to evoke cherished memories of Summer's past! 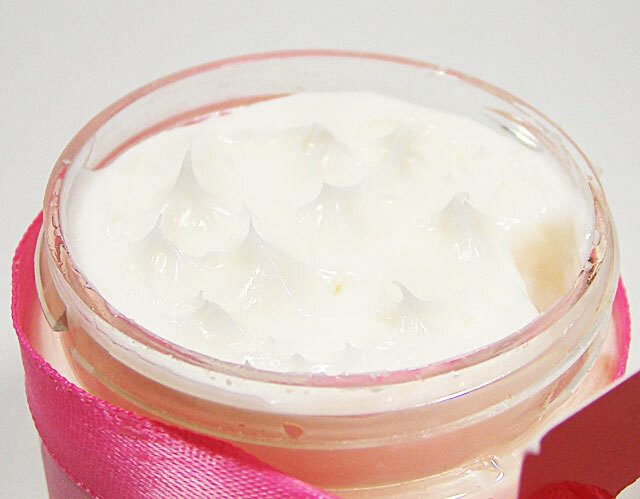 Body Frosting is a medium consistency and leaves a noticeable difference on my skin when absorbed. It feels soft kind of like those silicone livestrong bracelets. xD The scent is a mix of pina colada and something clean and fresh, and perhaps a vanilla base. Its not overly sweet or heavy and will be a good summer scent. Pineapple Cilantro Beautiful Body Butter - This one may be a new fragrance, I could not find it on her fragrance list. This scent is very refreshing, not heavy or sweet. I get pineapple but its not the bright overpowering pineapple I'm used to smelling, its almost got a creamy smell to it. There's something softening it in here and I almost want to say jasmine or some other really soft floral - this does not smell green or herbal at all. Its very refreshing, a little comforting and I think will be great for spring or fall. Also, those big tags that were tied on with ribbon were ingredient lists, so now I either have to save one of each or do a web lookup for ingredients. I have seen much smaller jars labeled with company name, website, scent, product type, and ingredients all on the sticky label and easily readable. Its not a deal breaker by any means, I just prefer it all to be on the product container for quick access should I need it. HBE is pretty light as you can see in the photo, I snapped that as soon as I lifted my finger and about 2 seconds later, that soft little peak fell. Its a light feeling lotion, spreads really well, moisturizes nicely, absorbs quick and leaves my skin silky feeling and not greasy. This will be awesome when I want a light moisturizer, like before a workout or on a really hot day where I will be spending time outside, or for my hands when I need the lotion to absorb quick. Though not the Moo dupe I was hoping for, I do really like it! --I can really smell the guava and lemon lime in this one. Maybe a little of the strawberries or sugar - its sweet smelling. I really love this, because I love how guava smells and the lemon lime brightens it up just a hair. Pixie Dust - This is an over-the-top girly-girl fragrance with sweet notes of fruit and a fun candy-like essence! Sugary, sweet and playful! --Definitely smells like sweet sugary candy, picking up a faint hint of cherry here too. Very nice! --This is the one I was most curious about. Toasty macadamias are what I smell first and foremost, not really getting coconut or passion fruit - but now I know what sunshine and beach smell like! Sunshine and Beach are soft clean scents, fairly light yet noticeable. They blends really well with the toasted note. I think I will really love this one to wear all over. BBB is thick but not solid, very nice consistency you can see in the photo how the butter has stiff peaks which hold their shape forever. This is a really nice butter, it absorbs well and leaves my skin moisturized and very soft feeling. I LOVE this stuff! Banana Buttercream Parfait - Smooth and creamy banana custard smothered with indulgent fresh whipping cream, banana slices, and rich buttercream pudding makes for an irresistibility sweet treat! --Highly recommended by jennistarbrite at MUA and I can see why. Its a yummy sweet scent. I'm getting something caramelly and I don't really smell the banana note in the jar at all, but I can smell it once I've applied it to my skin. I like this a lot! Its sweet and yummy. White Chocolate Macadamia Nut Cookies - Ooey, gooey, and delicious! This scent captures the essence of it’s namesake perfectly. Fresh baked buttery cookies loaded with sinful white chocolate chunks and tropical macadamia nuts. --Another scent highly recommended by jennistarbrite. I get a heap of white chocolate and very light almost hidden nuttiness. This reminds me of the Ulta White Chocolate body butter from a few Christmases ago. Yum! Strawberry Velvet Cake – Rich chocolate cake, frosted high with creamy vanilla infused marshmallow frosting and decorated with freshly picked strawberries. --The strawberry note in this reminds me of IOEs 7 strawberry lane scent. While my nose is not picking up a distinct chocolate note, there's definitely something warm smelling in there and oh yum, marshmallow! I'm on the fence with this one as a blend, but dissected each note is heavenly! I think I like it, its really unusual smelling and doesn't really seem that bakery/gourmand to my nose its a darker more sensual scent, similar in concept (not scent) to midnight pomegranate. These products were bought with my own hard earned money and my review was not influenced by anyone or anything other than the products and my own experience.